Forty one gorgeous Earth warriors of the 2015 Miss Philippines Earth flaunted their curvaceous bodies in colorful summer ensembles during the annual Resorts Wear Competition hosted for four (4) consecutive years by Pontefino Hotel & Residences in Batangas City, Batangas, last April 24. 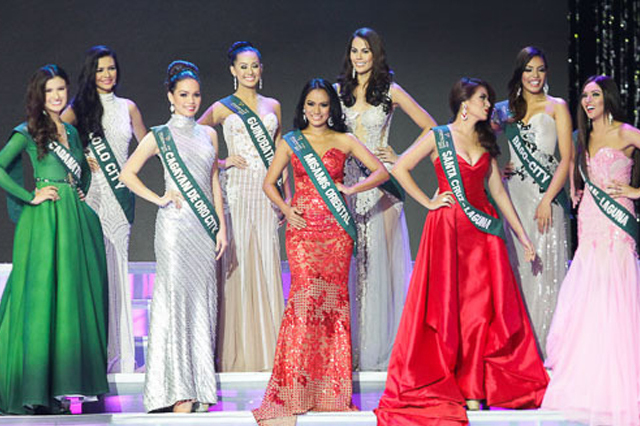 Adjudged winners were Chanel Olive Thomas of San Antonio, Nueva Ecija (Miss Pontefino Residences); Jona Sweett of Iloilo City (Bronze, Best in Resorts Wear); Angelia Ong of Manila (Gold, Best in Resorts Wear); Danica Ebrada of Muntinlupa City (Silver, Best in Resorts Wear); and Diana Mackey of Cabanatuan City (Miss Pontefino Hotel and CEO’s Choice Award). Best in Swimsuit winners were declared on April 30 at the Shangri-La Hotel & Resorts in Mactan, Cebu: Angelia Ong of Manila (Bronze); Chanel Olive Thomas of San Antonio, Nueva Ecija (Gold); and Mhone Theress Menaling of Mandaue City (Silver). Members of the media voted the Darling of the Press during the Press Presentation held in Diamond Hotel on May 7: Diana Mackey of Cabanatuan City (Bronze); Angelia Ong of Manila (Gold); and Chanel Olive Thomas of San Antonio, Nueva Ecija (Silver). Reigning Miss Philippines Earth Jaime Herrell (also 2014 Miss Earth winner) will relinquish her crown on May 31 at the MOA Area, to be telecast by ABS-CBN.